I'M NOT TAKING A BATH! NOT TONIGHT. NOT TOMORROW. NEVER! I'M A PIRATE, AND PIRATES NEVER TAKE BATHS! When a piglet tot with piratical pretensions puts his trotter down, Mom knows it's time for a little preschool psychology. She points out that our tot can't be a pirate, because he always gets seasick! It doesn't work. The piglet changes his persona, presto-chango. YEP. I'M A RANGE-RIDING, CATTLE-DRIVING COWBOY! The piglet may be imaginative, but Mom is practical. "COWBOYS DON'T MIND SLEEPING ON THE HARD GROUND. DO YOU?" Hmmm! Maybe home on the range is not so cushy. "FINE! I'M AN ESKIMO. THEY CAN'T TAKE BATHS. IT'S TOO COLD! Mom counters this ploy by pointing out that Eskimos also have to eat lots and lots of whale blubber. The game is now seriously on. How many hydro-phobic personalities can our dirty little piglet come up with to get out of his bath? How about an astronaut? No bathtubs in space, right? Well, no, Mom agrees. But "going to the bathroom" is a bit, um, problematical in zero gravity as well. But this mom finds a way to get her preschooler piglet into the suds, even if he does don flippers and snorkel to do it, in John Segal's latest, Pirates Don't Take Baths (Philomel, 2011). 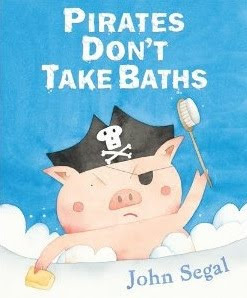 Bathtime battles are part of being a parent and being a preschooler, and Segal's charming illustrations make getting that little landlubber into the briny a little bit more fun.